Disclaimer: This post contains affiliate links, which means I may receive a commission if you click a link and purchase something recommended. If you are anything like me, you have tried just about every self care regime you can think of. 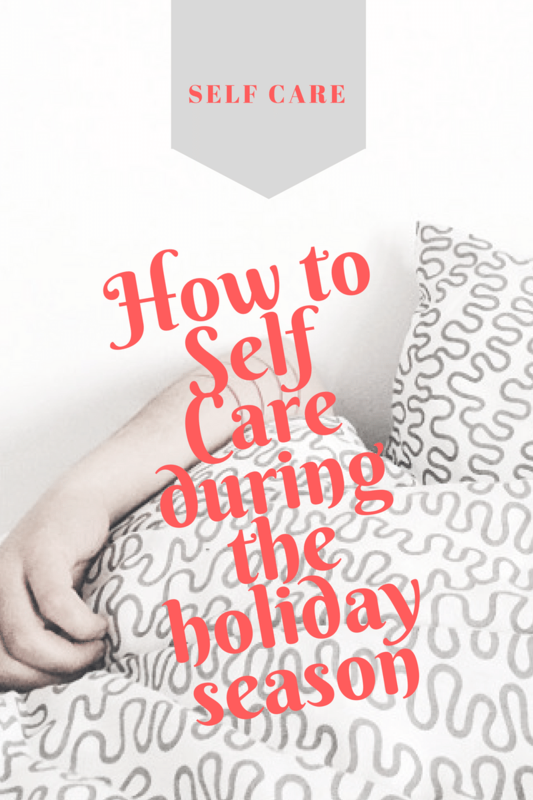 How to self care during the holiday season takes intentional, consistent motivation and discipline. The more you do self care, you will exercise the discipline of it. Be patient with yourself- this could take time. So why not start small? No need to overwhelm yourself with all the things you “outta do” just because people or yourself expect it or because the giving makes you feel good temporarily. We want and need to feel good about ourselves. The giving we do should be an overflow. Whatever this may look like to you. This might mean taking a 15 minute power nap. It could mean going for a walk. In the appropriate times- say no to people and yes to yourself when life becomes draining to you. Your break should release the tension and anxiety over what is bothering you. Schedule this in if you have to, in order to make this a healthy habit. Make this apart of your routine – everyday. Take a break and take a step back from all the noise and distractions.You are too important not to make yourself a priority. Go around your house writing positive messages about you, as an encouragement. Grab some post it notes and write down what you need to hear. Say those things out loud and believe them! A famous motivational speaker once shared that this is what broke her out of the depression she was in. This was in the misdt of her motivational speaking career. You have too much to offer as a one of a kind individual. One thing I do is carry around a little notebook. When I hear a positive quote or saying that is encouraging or inspiring, I get my notebook out and write it down. Then when I need to encourage myself, I go back and re-read what I wrote down. This helps me to get my mind focused on the positive aspects of life. It reminds me what life is all about. Some days are bad but that doesn’t mean your life is bad. Make sure you are writing down words that remind you of who the beautiful person you are and the purpose that you have. Pictures also have a lot of influence. I don’t know about you but sometimes I feel like certain social media can get a little overwhelming and put us in a sad state of comparing our lives to others. Organize your journal the way you want it, according to how you feel encouraged. Think about getting a journal/ notebook/planner like the one featured below. By clicking on it, you can see how beautiful it is and how you can customize it. No it's not selfish...just in case you were wondering. How do you expect to give if you haven't first taken the time for yourself? You can't give something that you don't have. No fake substitutions help anyone. They just feed other problems. For instance, if you haven't taken the time for a full night of sleep- the chances of you acting like a grump are slightly high. Make sure that what you are receiving feeds your mind, soul and spirit. What you do and carry with you, is an overflow into other people's lives. Do something healthy that sets your soul on fire. This could change with time and circumstances. Look for opportunities to invest in your well being. Set up a time to go to the gym or fun workout class. Put on a cute workout outfit on, like one featured below from Dresslily. This will get you in the mood to want to go workout, at least for me that works haha. Whatever gives you joy and makes you feel alive from the inside out, are things that are important. These things need to be put into your schedule. I don't care how many excuses you have. If you need to completely re-do your schedule to fit in- do it. The people that surround you should care about you and your well being. Ask for support in this journey. Nobody in this entire world gets to be you. Take full advantage and go be your awesome self. Read, write, dance, laugh, chat, run, walk, relax. I love this post! Self care is so important, we neglect ourselves at times to serve others but you can’t pour from an empty cup! I have post its on my wardrobe that serve as a daily reminder of who I am and what I want. I’ve found that these affirmations keep me grounded. Additionally, I think investing in yourself is key. If you don’t, who will? Thanks for the reminder. As a mother sometimes we forget to take care of our selves, especially this time of year.